Read Mark Binelli's article about this book in The Believer. This is an astonishing first novel from an unhinged comic genius. 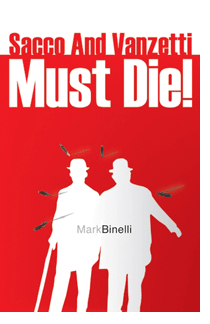 The Nic Sacco and Bart Vanzetti of "Sacco and Vanzetti Must Die!" are not the infamous anarchists controversially sentenced to death by the United States government for an act of terrorism they may or may not have committed, but a pair of silent film stars and slapstick comedians. At least, at the start of "Sacco and Vanzetti Must Die!" they are not the infamous anarchists...The thing about "Sacco and Vanzetti Must Die!" is that it defies conventional description. Part comic novel; part satire; part Pynchonesque slurring of synchronous narratives into historical allegory; and part political commentary, it is wholly brilliant, utterly bonkers and unreservedly, unabashedly one of the best debut novels written in the last 20 years. Laurel and Hardy-esque Ioons Nic Sacco and Bart Vanzetti rise to fame from a seedy New York vaudeville club via their famous knife-throwing gag, landing precipitately in the bigtime - movies, international tours, disastrous openings for Bob Hope - all the while indulging in a sprawling, multilayered dialogue about who, how and where they should be. One will be fat; the other skinny. One is contemplative and the other is impulsive. Both will be completely hilarious and, as their fictive selves merge with their legendary namesakes and time, history and parable collapse on their unhinged heads, the unforgettable centres of this genre-defying comic howitzer.